The most important weapon in a bride's beauty is her hair. Hair care can be tricky during wedding seasons due to stress and less time dedicated to hair care. Although most of the hair care comes from proper diet, it is also important to use the right shampoo and other products that are used on the hair. Soft and shiny hair is what we all need and yearn for. But without proper care, especially in a country like India, with loads of humidity in the air, it is a nightmare to get your hair listen to you on your wedding day. 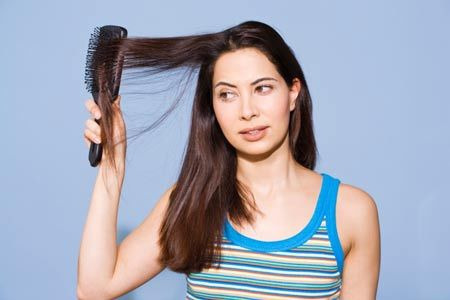 Here are some tips that will help your hair look shiny and also enable faster growth. 1. Cleanse gently: Use mild shampoos and conditioners every two days. This helps your hair retain its essential oils, keeping it moisturized. If you have excessive hair oil on your scalp, you can use shampoo with less ph. balance to maintain the moisture. Most gentle hair care products have no PARABEN, AMMONIA, and SULPHATE and contain lesser amount of zinc than many other shampoos. 2. Choose a shampoo that suits your hair best. All you have to do is observe your hair type by touching it. If it is soft and fine, go for a voluminous shampoo. If your hair is dry and brittle, you a deep moisturizing shampoo to hydrate your hair follicles. Keep in mind to oil your hair every time or at least twice a week before washing it. 3. Deep conditioning your hair every 21 days is good way to keep your hair healthy. If you find it expensive to go to a parlour to get this done, you can always buy deep conditioners at your nearby salon or cosmetics shop like "health and glow". 4. Remember not to cut your hair right before your wedding as it might be difficult for the hair stylist to manage your newly cut hair. Also f anything goes wrong with your haircut, it is going to reflect on your overall look. 5. Drink plenty of water and eat anything that is rich in iron like fig and dates. This will strengthen your roots thus preventing hair fall.